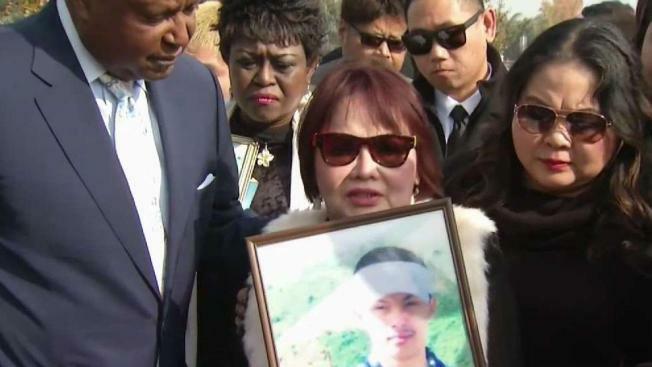 A Fremont family is filing a civil rights lawsuit against the City of Danville and the Contra Costa County Sheriff's Office. Damian Trujillo reports. A Fremont family is filing a civil rights lawsuit against the City of Danville and the Contra Costa County Sheriff's Office. The lawsuit comes after a 33-year-old man was fatally shot by police in his car. Police officials said the man tried to run over an officer earlier this month. Funeral services for the man, Laudemer Arboleda, were held Monday at St. James the Apostle Church in Fremont. Prominent Civil Rights Attorney John Burris, who is representing the family, announced the lawsuit at the church lawn. Burris said Arboleda was not posing any danger and was shot partly because he was brown. A Danville police officer shot Arboleda's car at least seven times after other officers tried repeatedly to pull him over. The call was of a suspicious man casing a neighborhood, carrying bags filled with unspecified items. "My uncle didn't break any laws," said Jessica Leong, Arboleda's niece. "He did not have a criminal record." Police said Arboleda drove his car toward an officer, who fired his gun in self defense. But the family said the officer had plenty of time to get out of the way, and did not have to kill their family member. "I want justice for my son because of the unexpected killing and wrongful death," said Jeannie Atienza, Arboleda's mother. The civil rights lawsuit filed by Burris claims the officer was not trained adequately. It also claims Arboleda, who suffered from mental illness, was seen as a suspect partly because he's Filipino-American. "All we know is he was a colored person, he was driving a car, and he was shot by a white police officer," Burris said.